Preparation is mandatory for any outdoor excursion but when you’re knee deep inside a camping gear, it’s very obvious for you to forget some of the most essential items including your sleeping bag or first aid kit. Therefore, it is important to have some pre-planning before your adventure trip. For the planning, part to be carried out successfully, create a camping checklist of ‘must need’ camping essentials. Below is the list of some of the most essential items that must be a part of your outing. This is the most required item you need to carry in your camping bag. Moreover, choosing the right tent is also an important part of your tour packing. Go for a waterproof tent to protect you from bad weather conditions. Along with this, select the tent which is easy to set up so that there comes no obstacle in your way to enjoyment. Something that will be an obvious part of your trip is burns, cuts, bumps, and scratches. Thus, you need to be prepared with a first aid kit so that you can wipe out every single obstacle of your fun trip. Carry all the required essentials in your first aid kit and keep it in your bag during the time of planning itself. In a camping tour, you definitely need some kind of flame to start a fire. With fire, you get a variety of food options and you are protected from the harsh and cold nights as well. Don’t take a risk of forgetting matches so buy them in bulk. The rope has infinite uses at a campsite and it can be beneficial for you if you are able to tie a range of knots. With the help of a rope, you can make clothes line where you can hang your wet clothes, build your own shelter, or even it can help towing individuals out of a severe situation at the time of hiking. You are not advised to go campsite without a rope. The reason of adding peanut butter to your checklist is that it has an extended shelf life, and you can use it in several ways, more than you can really count. As a multipurpose supply of protein as well as fat, peanut butter will be your best friend at the camping. Consequently, you can smear it on bread, relish it in spoonfuls or more interestingly, remove gum from your hair. 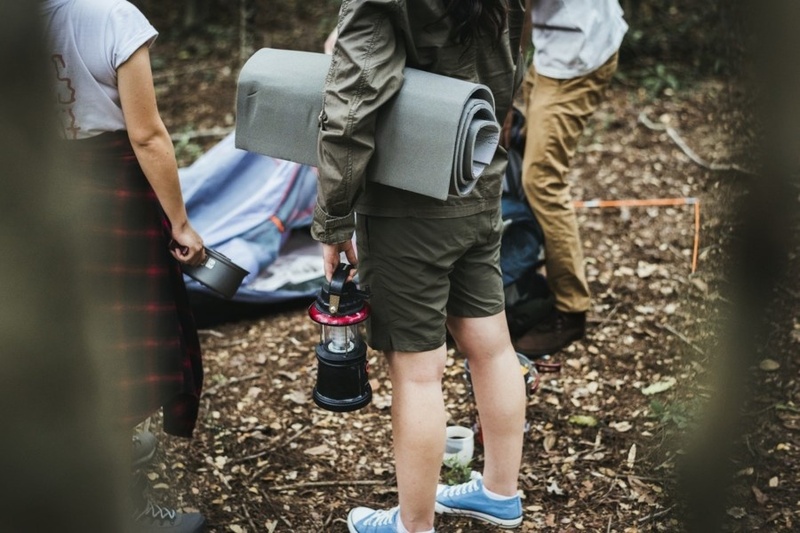 Whether you’re tentative to the bathroom after dark or nagging a midnight snack, you should carry a lantern or a flashlight in your campsite essentials bag. Make sure that the light source is easily reachable in the car, in case that you reach at your site after dark. Water, the basic necessity of life, is a most essential requirement of a camping trip. Try to bring re-usable water bottle with you. You can refill it at the campground’s water spigots. Sipper bottle with a spill-proof locking mechanism is recommended. You are a digital native, you must be having a GPS facility on smart phone; you may also have a GPS system in your car console. Unfortunately, there may be a bad signal or no signal in isolated camping spots. At that time, maps and compass will help you find your place of destination. Weather is something which is highly unpredictable, no matter how sure the weather prediction is. Maybe there is no rain during the time of planning the excursion but sadly, the weather changes at the time you reach your destination; you can thus be trapped in the rain or huddle around the camping area. Always go to the campsite with some extra set of clothes then you need not worry about unexpected weather changes; you can simply swap out wet clothes for dry ones. The pocket knife is a must to have camping essential. This tool takes little space in your camping bag. Along with a pocket knife, you can carry a corkscrew, small scissors and more, as with this, you’ll have different camping prerequisites in a trouble-free small size pack. A good pair of a hiking boot is extremely important on a camping trip. If you are an adventure lover and planned to go for a hike, never go without a pair of sturdy and tough hiking shoes. With these essentials, you are all set for your adventure camping tour. Pack your backpack and get ready for a hassle-free enjoyment trip!